What’s What and Who’s Who! The different terms used to describe Opticians and common problems can sometimes be confusing so here is a handy quick guide. A Consultant Specialist Eye Doctor at a Hospital. These both mean the same thing! This is someone who tests your eyes to check for any prescription & checks the health of your eyes. Only a fully qualified and registered person is allowed to use the term Optician. Linda is a qualified registered Optician and full member of GOC and College of Optometrists. Among other things, specialises in recommending the best lens & frame selection for your needs. Only a fully qualified and registered person is allowed to use the term Optician. People who have myopia (short-sightedness) have difficulty seeing distant objects and signs, but can clearly see objects that are near. In short-sighted people, the eyeball is too long or the cornea has too much curvature, so the light entering the eye is not focused correctly. Short-sightedness runs in families and usually appears in childhood. Glasses, contact lenses, or refractive surgery can correct short-sightedness. Long-sightedness, or hypermetropia or hyperopia, makes it hard to see objects close to you. It happens when the eyeball is too short, not curved enough, or if the lens is not thick enough. Long-sightedness can affect children, but it may also be age-related, affecting over-40s. This is called presbyopia. Symptoms of long-sightedness may include blurry, close-up vision with clear distance vision; squinting; easily tired eyes; and pain or a burning feeling in the eyes. Long-sightedness can be corrected with glasses or contact lenses and in some cases with laser surgery. This is a condition associated with aging in which the eye exhibits a progressively diminished ability to focus on near objects. Presbyopia’s exact mechanisms are not fully understood; research evidence most strongly supports a loss of elasticity of the crystalline lens, although changes in the lens’s curvature from continual growth and loss of power of the ciliary muscles (the muscles that bend and straighten the lens) have also been postulated as its cause. The first signs of presbyopia – eyestrain, difficulty seeing in dim light, problems focusing on small objects and/or fine print – are usually first noticed between the ages of 40 and 50. The ability to focus on near objects declines throughout life. The first symptoms most people notice are difficulty reading fine print, particularly in low light conditions, eyestrain when reading for long periods, blur at near or momentarily blurred vision when transitioning between viewing distances. Many extreme presbyopes complain that their arms have become “too short” to hold reading material at a comfortable distance. This is a common eye condition that’s easily corrected by glasses, contact lenses or surgery. Astigmatism is characterised by an irregular curvature of the cornea. This type of disorder is also known as a refractive error. Astigmatism occurs in nearly everybody to some degree. For significant curvature, correction is required. 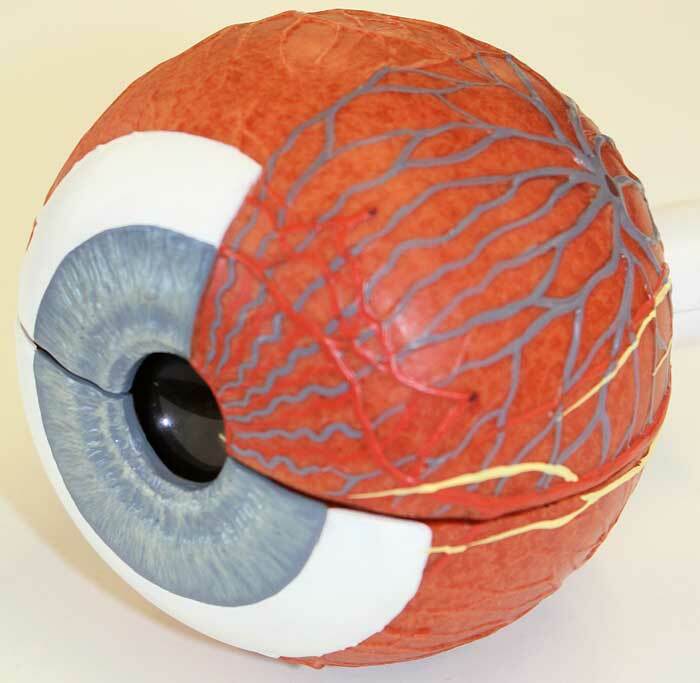 A person’s eye is naturally spherical in shape. Under normal circumstances, when light enters the eye, it refracts evenly, creating a clear view of the object. However, the eye of a person with astigmatism is shaped more like a rugby ball or the back of a spoon. For this person, when light enters the eye it is refracted more in one direction than the other, allowing only part of the object to be in focus at one time. Objects at certain distances can then appear blurred. In an infant or a child, the brain will not tolerate double images and will shutdown the vision in the weaker eye. This involuntary loss of vision is called “lazy eye” or amblyopia. Here’s another way to say it: Amblyopia is a healthy eye that does not see. Only infants and children develop amblyopia; and the vision loss can be reversed with therapy if the contributing eye problem is corrected during childhood. Amblyopia is a serious problem for your children. So long as the underlying eye problem remains untreated, the vision in the weaker eye does not develop fully. Lazy eye can also result from other eye problems, such as ptosis (drooping of the eyelid) or a significant refractive error in one eye. If detected early amblyopia can be corrected with patching and/or eye drops applied to the better eye – forcing the weaker eye to recover useful function. These are tiny spots or specks that float across the field of vision. Most people notice them in well-lit rooms or outdoors on a bright day. Floaters are often considered normal, but can sometimes indicate a more serious eye problem. These include conditions such as a retinal detachment, especially if floaters are accompanied by light flashes, or any reduction in your field of vision, like a curtain falling over the eye. If you notice a sudden change in the type or number of spots or flashes you see, seek medical advice as soon as possible. This happens when tear glands cannot make enough tears or produce poor quality tears. Dry eyes can be uncomfortable, causing itching, burning or, rarely, some loss of vision. Your doctor or eye specialist may suggest using a humidifier in your home, special eye drops that simulate real tears, or plugs that are placed in tear ducts to decrease tear drainage. Surgery may be needed in more serious cases of dry eyes. Having too many tears can come from being sensitive to light, wind or temperature changes. Protecting your eyes by shielding them or wearing sunglasses can sometimes solve the problem. Tearing may also mean that you have a more serious problem, such as an eye infection or a blocked tear duct. Your doctor or eye specialist can offer advice about treatment for these conditions. Cataracts are cloudy areas that develop within the eye lens. Since the lens in a healthy eye is clear like a camera lens, light has no problem passing through the lens to the back of the eye to the retina where images are processed. When a cataract is present, the light cannot get through the lens as easily and, as a result, vision can be impaired. Cataracts often form slowly, causing no pain, redness or tearing in the eye. Some stay small and do not alter eyesight. If they become large or thick and affect vision, cataracts can usually be treated with surgery to replace the lens. When fluid inside the eye does not drain away properly, a build-up of pressure inside the eye can lead to a condition called glaucoma. The pressure damages nerves and the vessels in the eye, causing changes in vision. In the most common form of glaucoma, there may be no symptoms of this eye problem at all until the disease is very advanced and there is significant vision loss. In the less common form of this eye problem, symptoms can include headaches, eye aches or pain, blurred vision, watering eyes, halos round lights and loss of vision. Glaucoma is very easily treatable often with a simple eye drop and is one of the most preventable causes of vision loss if caught early. Unfortunately if Glaucoma is not diagnosed and treated irreversible vision loss can occur which is why it is important to have sight tests at regular intervals. The retina contains a group of specialised cells that convert light as it enters though the lens into visual signals. The eye nerve or optic nerve transmits visual information to the brain. Diabetic retinopathy is one of the vascular (blood-vessel related) complications related to diabetes. This diabetes eye problem is due to damage of small vessels and is called a ‘microvascular complication’. Kidney disease and nerve damage due to diabetes are also microvascular complications. Large blood vessel damage (also called macrovascular complications) includes complications like heart disease and stroke. The microvascular complications have, in numerous studies, been shown to be related to high blood sugar levels. You can reduce your risk of these eye-related diabetes complications by improving your blood sugar control. This the leading cause of severe vision loss in people over 60. It occurs when the small central portion of the retina, known as the macula, deteriorates. The retina is the light-sensing nerve tissue at the back of the eye. Although it almost never causes complete blindness, age-related macular degeneration can be a source of significant vision loss. The macula is the most important region of the eye. It is a very small portion of the retina and is about 5mm in diameter. The macula is loaded with photoreceptors that allow you to read, watch television, drive, sew — anything that requires focused, precise vision. In its early stages, age-related macular degeneration may not have any symptoms and therefore may not be recognised until it progresses or affects both eyes. The main symptom of macular degeneration is blurring of central vision. This may progress to a gradual loss of central vision. Straight lines appearing distorted (wavy), or the centre of vision becoming distorted. Dark, blurry areas or blind spots appearing in the centre of vision. Diminished or altered colour perception. Difficulty recognising people’s faces, reading text or seeing television clearly. If you experience any of these symptoms, seek medical advice from you Optometrists as soon as possible.